Archie Andrews is really different now. So is Betty Cooper, the girl-next-door who’s not his girlfriend anymore. But we haven’t seen much of the third part of the classic comic-book love triangle in Archie Comics’ newly-rebooted flagship until today. I dunno, guys... Veronica might be kinda cool? Archie #3 comes out this week, featuring the first appearance showcase of the updated, redesigned Veronica Lodge. The rich girl who spends Daddy’s money has only been glimpsed briefly during the series so far, but she’s going to get more of the spotlight, as the preview pages below show. 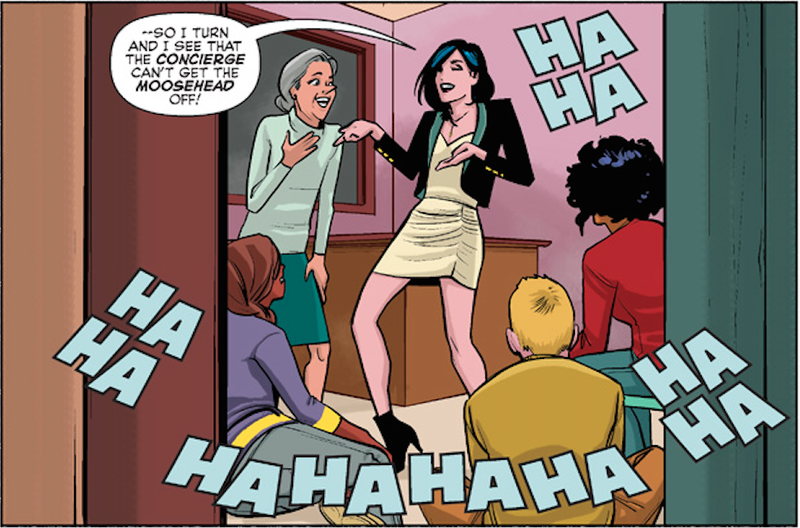 Despite the fact that Jughead calls her a ‘Kardashian klone,’ Veronica seems like she might have some actual charm, wit and personality. That’s a surprise. Those sequences above look like they’re setting up the worst kind of friend-vs.-infatuation scenario for poor Archie, the one where your best bud hates on the person you’re inexplicably drawn to. But, with the way that Mark Waid, Fiona Staples and the rest of the creative team has been throwing curveballs with the new Archie, I don’t think the dynamic between these characters will be so cut-and-dried. We’ll see when Archie #3 hits brick-and-mortar and digital storefronts this week. Dig on those variant covers below, too.